The Views at Superstition is absolutely amazing, and Tracy, Terri, and Diane are a fabulous team to work with. The stunning view of the Superstition Mountains from inside the ballroom and on the balcony left my guests in awe. The venue is absolutely gorgeous and was designed by the owner, Tracy. Because she’s the owner, she has the ability to customize the venue as needed, as opposed to a country club venue where everything is basically predetermined. Tracy offers several options for the ceremony location, some of which are on site. We chose our ceremony to be at Lost Dutchman State Park in the Superstition Mountains, which is about 10 minutes away from The Views at Superstition. Tracy and her team did a fabulous job setting up the ceremony site to perfection and the amazing mountain background was breathtaking. They are SO extremely organized and well detailed, and they do all this with the upmost sincere smiles and the most amazing positive attitudes and energy! We could not be more thankful for everything they did and we are so extremely grateful we chose this venue for our special day. Thank You, Thank You, Thank You. Thank you Julie for such kind compliments! We do strive to be as flexible as possible, we don't have to answer to many people so it makes our job easier. You chose the most amazing site, Lost Dutchman State Park with such spectacular views! Your pictures from LightRain Images were some of the best I've seen! Kindness is contagious, you guys were super sweet and we loved working with you. We wish you all the best and a lifelong happy marriage. Thank you again, you're the best!! I wish I could relive this day! Tracy is amazing to work with. Beautiful venue! She works with amazing vendors. Thank you Damariz! It was a great pleasure working with you and Luis! You were such a sweet and chill couple. 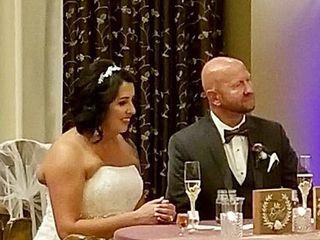 I still re-live your wedding by looking at your AMAZING pictures!! You are such a picture perfect, beautiful couple!!! I wish you a lifetime of happiness! We recently had our wedding (180~ guests) at the Views, and I can't say enough good things about it. Tracy was amazing! Always responsive and very flexible. We planned our wedding from out-of-state, so her help was invaluable. We didn't feel restricted in our choices at all. The value was great, and the view is just breath-taking, especially at sunset. Our guests were beyond happy and so were we. I'd highly recommend the Views to anyone planning a wedding in the area. Thank you Rebecca for your amazing review! We do try to be as flexible as possible! We want everyone feel like it's a simplified planning process and you can leave the worrying to us! Choices? Yes! We love to help in anyway possible...Glad you were beyond happy! Best wishes to you and Omar! Love xoxo Tracy & The Views Team! This was such a great option for us since we were planning our wedding out of state. With the all inclusive option it took out all the guesswork. Not to mention the venue is absolutely stunning and our photos turned out amazing. They take care of everything to the point where you can just show up and get married! Thank you so much Kristie!!! It was really nice working with you! 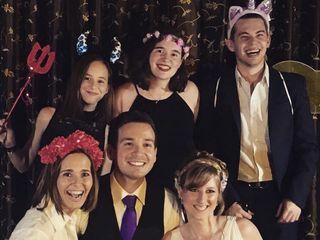 We love to make your life a bit easier and we are really determined to make our out of town brides feel like where you live is not an obstacle. Your photos are AMAZING!! We actually just enlarged the bridge site photo of you both for the office!!! That says a lot, right?! Congratulations again and have a blessed marriage. All the vendors mentioned how "in love" you two were. So sweet!! Love xoxox The Views Team! This venue is amazing! Tracy and her team are so kind and helpful. They help with every step of the process. Even if you call or email them and they are busy in a meeting or setting up for an event, they will get back to you as soon as they can. Tracy and her team will do anything and everything to make sure your wedding is perfect! I have read many wedding articles saying that at least one thing during your wedding day will not go as you planned (or something along those lines). Our wedding day here at this venue was absolutely PERFECT and NOTHING went wrong! This venue made it very easy to plan my wedding and stress free! Tracy will coordinate with all your vendors the weeks leading up to your wedding date to confirm everything. I also contacted all my vendors as well just to confirm everything was good to go. 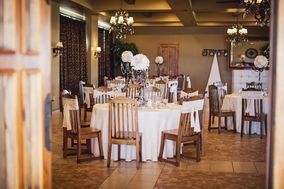 The views at this venue are simply amazing from the banquet hall, to the outdoor patio and of course where we got married on the golf course!! The name of this venue says it all, The Views at Superstition. We will cherish this day and all the memories for a lifetime! This venue is a hidden gem in Gold Canyon! They also have inclusive packages and you can customize them to fit your needs for your wedding. This team is truly amazing and love what they do for their bride and grooms on their special day!! Thank you so much for everything you guys did to make our wedding day so PERFECT. We cannot thank you guys enough! We will definitely be back whether for just a party or an anniversary! If you want your dream wedding to come true, do yourselves a favor, look at this venue and book it!! You will not regret it! I want to sincerely THANK YOU for the delightful review. I really appreciate all the kind words and I am super happy that your day was perfect! I really enjoyed working with you and Benjamin from the start and will miss seeing you at our open house. Please feel free to stop by any time. I would be honored to host a family event for you - stay in touch! I wish the best for you always! Thank you Shannon & Ryan! It was an absolute pleasure working with you! Everything you chose was beautiful! Your families were delightful!! Thank you for making my first wedding of the season a GREAT ONE!! I wish you a lifetime of happiness! This place is absolutely beautiful!!! I had my wedding ceremony here about a week ago now and it was everything I had ever dreamed of! Tracy and her staff were very helpful even down to the last minute music preparation. Love this place!!! Thank you Julie!!! We are so delighted to hear this! We are always happy to accommodate where ever we can!! Tracy is seriously the best! We initially didn’t think we needed a day of coordinator so when things got overwhelming, we looked for one and found Tracy! I don’t know what we would have done without her. We are so so lucky to have had her as our coordinator. Before the wedding we chatted for hours and she walked me through different timeline scenarios. On the wedding day she was amazing. She handled all the tough situations and kept us calm all night. She was so good with my family (some of whom can be stressful to deal with) and she did everything with the best attitude. Also, since my wedding was an Indian wedding, it can get a bit confusing since there are so many pieces but Tracy handled it all. She was so excited to learn our culture and caught on so fast. She is just so sweet and so good at planning that she was so perfect for our wedding! We couldn't have asked for a better day! Tracy, Terri and Diane were absolutely amazing! From the moment we met with Terri all the way to the end of our big night with Tracy and Diane every was perfect. They worked with our budget and how simple we wanted to be. Even as our guest list grew they were very accommodating and continued to be supportive throughout the whole process. Thank you for your kind review! We are so pleased to hear your thoughts on The Views At Superstition. Our team strives to be as supportive and flexible as we possibly can. It's your BIG day and we want it go smoothly!! So glad it did! Thank you!! The Views Team. The Views at Superstition was by far one of the best venues we looked at when we were searching for a venue. Not only did their package(s) provide pretty much everything we needed for the wedding (which allowed a less stressful planning process) but the Superstition backdrop was breathtaking. Tracy was very responsive. Dianne, whom we worked with for all the details, was great! She made sure everything ran smoothly the day of and all our needs were met. I would HIGHLY recommend The Views for any event! Thank you Adri!!! We're so glad to hear you liked our packages and everything seemed stress free! Your pictures are amazing, we will share them over and over. What a beautiful couple you two are, and your set-up was awesome! Thank you again for trusting us with your big day, we feel blessed to be a big part of it! Traci, Diana, Terri, and the rest of her staff are so amazing. They have such a good working relationship with each other and with our other vendors that the entire wedding was so smooth and stress free. Our ceremony was held at the tree site, such a beautiful/budget friendly location. We requested bubbles to be placed on each seat for a bubble exit down the aisle that went off flawlessly because of the staff at the views. When we did our grand entrance into the reception hall, which was about a mile from the ceremony site, I was blown away by how lovely the place was set-up. Our sweetheart table was in the perfect location, our families were placed next to the dance floor, the memory table was lit with candles, and our guest book was displayed so beautifully I couldn’t have done it better myself. Our guests couldn’t stop marveling at how beautiful the sunset/mountain view was from the back balcony. Our wedding was for 100 people and the versatility of the space is so evident, I would recommend this venue for anyone’s wedding or any other event that you want to impress your friends and family without breaking the bank. Thank you, Thank you, Thank you! We were super excited to host your wedding and to be apart of your special day. Our vendors are very important part of our weddings, and we do expect them to be an intricate part of the whole experience. We can wait to see the photos from LightRain Images! Happy Life and Happy Marriage to you and Santiago Almada! Tracy and the team at the Views were perfectly accommodating. Our wedding was so easy plan with the venue's help. We attended the vendor night and selected every vendor for our wedding which helped the process even more. As for our day, well, our guests were happy, the layout was perfect, and the sunset pictures we were able to take were the icing on the cake! You two were so much fun to work with! We're so pleased it felt easy to plan your wedding with us. We do enjoy having our vendor nights where we can all get involved with the planning process together. It does make it simple! We could not be happier with your amazing photos you received from Lia's Photography! Wow! Thank you for your kind review, and we wish you and Chris a beautiful life together. Working with the Views was a great experience. No stress and everything was perfect! Highly recommended! Dear Jenni, Thank you for your review. We so happy to hear it was stress free! That's exactly what we aim for, we strive for a smooth & happy wedding! Congratulations Jenni & Paul! We wish you all the best! After looking at and pricing a few different venues, The Views at Superstition was one that checked off all of our boxes. We could do an outdoor ceremony, have beautiful surrounding views, within our budget, etc. We liked that there were 'Preferred Professional's as well. We were able to choose from 3 to 6 different vendors in each category (cake, florist, caterer, photographer, etc). This made the whole planning process easier because we didn't have to sort thru hundreds of different vendors. All of the vendors they have are very talented and made some of the decisions difficult! :p Everyone that works at The Views were AMAZING. I started off working with Terri. She took us on a tour and wound up booking our date(11-03-2017). Once the process started really moving, we started communicating with Tracy. She always answered our questions, provided suggestions if needed and was attentive. I asked a bunch of questions throughout the entire process and she was always okay with me making changes. Even up to a few days before! She made the whole process so easy. When it came down to our wedding day, Tracy made sure everything was perfect. They always say that there are things that are going to go wrong on your day, but nothing went wrong. Tracy made sure everything was set up/taken care of in the beginning and Diane made sure everything continued to go smoothly throughout the night until the end. Diane was always updating me and asking me things before just going ahead and doing them. The communication these ladies have is fantastic. I was so impressed. I cannot say enough about The Views and the ladies of The Views. I want to thank them for making mine and Robert's wedding day PERFECT. And I mean that. I couldn't have asked for a better wedding day and the ladies of The Views helped our day be perfect. I would 100% recommend this venue for a million different reasons. You will NOT be disappointed with The Views! Tracy is amazing!!! She and Terri made the wedding planning process a total breeze with their preferred vendors, all of which are also amazing. My wedding was truly perfect in EVERY way and I am SO GLAD I choose The Views!!!! Thanks again!!!! We were so blessed to meet you two, everything feel into place immediately and we all knew it was meant to be. Thank you for your kind words and photos! We can't wait to see more! We could not be happier for you and Anthony! Have a beautiful life together...The Views Team! The Views is an amazing place to get married! It was stress-free, really stress-free! The people at The Views and their vendors are great people to work with. They are very kind and are genuine when they say that they are there for you when planning your wedding. I would recommend anyone to have their wedding at The Views! Thank you Morgan and Alex! We are so pleased it was stress free! That's a great testament to you too. You planned everything so well. It was great having you there for one of our big open houses, we remember you two decorating your table with the linen colors you wanted and Dancing with Chad and Brisa to learn a few steps or two. We enjoy seeing our brides and grooms coming in often to feel more comfortable with everyone. Have a wonderful marriage! The Views Team! I couldn't have dreamed of a more perfect wedding day and this beautiful venue. The owner Tracey and her staff were incredible from start to finish and my day went so flawlessly. Tracey was always prompt with communication and answering any questions we had leading up to the wedding. She truly cares about what they do! 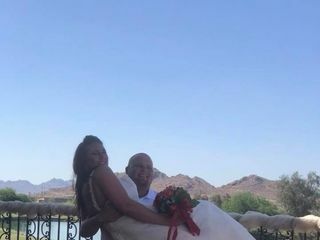 There are so many beautiful options to get married at but we chose the bridge site which had an incredible view of the Superstition mountains. Every photo with that view as a back drop is unreal! The Reception area is gorgeous for any theme! The wood beams and chairs matched my rustic theme perfectly. We got so many compliments on the venue and our vendors which we chose through their preferred vendors list. I highly recommend this venue! I promise you will not be disappointed! Thank you so much Tracey and your team for making my wedding day perfect and a day myself and our entire family will be talking about! Thank You Brittany for sharing your gracious and amazing compliments! We do really care and we're so glad it shows! We do try to keep our ballroom neutral so it can go with any color scheme. Thank you for mentioning our preferred vendors, without them we would not look good! They make the day go smooth and seemless. And LIA Photography! She's amazing. We love her and Max so much! Tracey and her team were extremely accommodating throughout the planning process. I had to do a lot of planning from out of state and they were able to work around my schedule. Even last minute requests they were able to oblige - with a smile. It was great working with The Views because it is a one-stop-shop. I chose all of their preferred vendors and the venue handles paying the vendors directly, including TIP. Made things so easy for me come the day of the wedding. I did a lot of research and the preferred vendors were well selected by Tracey and her team. The Views are exceptional too! I highly recommend The Views at Superstition for your wedding! Tracy and her team are AMAZING! I was an out of state bride and they made the entire planning process painless and easy! 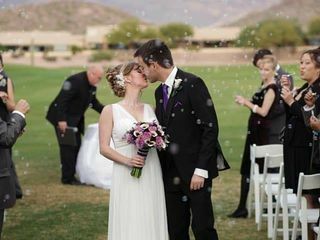 The venue is absolutely stunning and the views of the Superstition Mountains are unbelievable, it is the perfect backdrop for any ceremony! My wedding day was more than I ever dreamed of and there was no stress the day of, everything was seamless and I can't thank Tracy and her team enough for making my day so special! Thank you Lauren & Aaron for sharing your beautiful wedding with us! We really appreciate your kind words and we're so happy to hear you were please with everything! We hope you and Aaron have a very happy and bright future together. Thank you again for trusting us to host your wedding! Wow, where to begin! I truly can't say enough positive things about this venue! Not one flaw at all! Everything went so smoothly. We had our wedding ceremony (Bridge Site) and reception here on November 12, 2016. We met with Terri a year ahead of time and she showed us around and invited us to their vendor nights, which I HIGHLY recommend going to. It helps you taste the food of their different vendors and talk with other vendors such as Florists, photography, DJ Services, and MORE! Terri was amazing at explaining everything and showing us their different packages. We ended up going with the 10K package. Tracy is SO easy to work with and VERY responsive. When I felt like I might be bothering her too much when it came closer to the wedding date, she didn't make me feel like I was annoying her at all. She is SUPER organized down to every little detail. Details that you wouldn't even think of! She really knows what she is doing and is an EXPERT. On the DAY OF, Diane, a wonderful lady, helped with setting everything up...down to pinning the boutonnieres on the groom and groomsmen. Their Bridal Suite was just the right size and very comfortable to get ready in. I would suggest going there to get ready the day of as early as you can. Time flies the day of and you want to savor every moment. They even have a nice Groom Suite on the other side of the venue for the groom and groomsmen to get ready in. Ladies, I can't thank you ENOUGH, words cannot describe how thankful I am to have found your venue. You made my day so memorable and I felt like a princess on top of the world. Our venue was perfect! 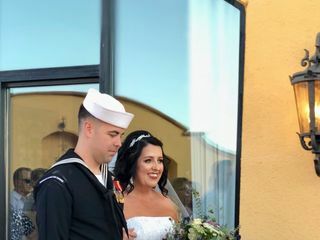 We had the best scenery with beautiful mountains in the background for our ceremony and all of our pictures. Everyone gave us compliments on how amazing the location was for our wedding. Terri and Tracy were so wonderful to work with. I was planning from out of state so we had to email or talk on the phone and they were always so quick to respond to all of my questions. They provide all inclusive packages which made my planning so much easier. I had a list of vendors to choose from rather than starting from scratch. They were all highly reviewed and I was so happy with every single vendor I chose. 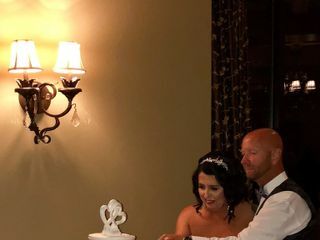 I loved working with Sedona Trail Catering, Wild Iris Wedding, DJ AZtecaMix, Graceful Cake Creations, The Wedding Dr. We were able to personalize everything and it all came together so perfectly. Tracy did a great job coordinating everything. I chose colors for my linens through a website and Tracy picked them up and called me just a couple of days before the wedding and she felt like it wasn't exactly the color I would want and she was correct! It was a bright purple that would not have gone well with the mauve colored bridesmaids dresses so I was able to pick a new color for my linens just two days before since that was when I was flying in to Arizona for the wedding. She was just so kind and happy for us that it made the whole experience so much easier. I am so happy we chose to get married here!! Thank you so much for all the kind words. They mean the world to us! 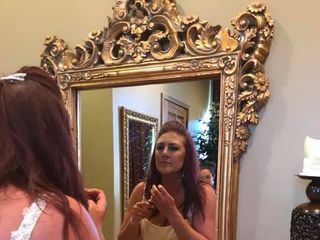 We take a lot of pride in helping our brides with the details and making sure everything is perfect as can be! Our vendors are so helpful and some of the best in the industry, thank you for mentioning their names. We're so happy you chose The Views and we wish you the very very best in your happy life together!